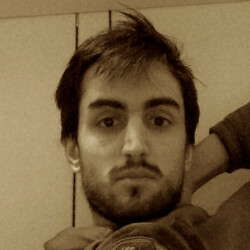 Matteo Sabbatini, 24, Italian, Student. I'm currently a Master student in Mathematics at Università di Milano, Italy. I love mathematics and lately I have been studying a lot of cryptography, which is probably my favourite field right now. I am writing my master thesis with Professor A. Visconti of Università di Milano, about a new form of Digital Cash. I had previously collaborated with my professor during the lectures of the bachelor course Crittografia 1, where I was sometimes asked to lecture the students. I spent my first year of Master in the Netherlands, where I studied at University of Leiden and I followed courses of, mainly, Number Theory and Algebraic Geometry. Besides my academic life: I love playing football, although I'm not a fan and I don't really like watching it on TV. I love to travel and I travelled a lot around Europe and Italy; hope to enlarge my horizons during next years. I like teaching and recently I collaborated with my ex high school for some teaching projects about mathematics and computer science. Select Topic Select What is Cryptography?